November has been World Vegan Month, and while I’m a long way off from becoming a full-time vegan, I have been enjoying experimenting with more vegan dishes and am keen to make a greater proportion of my diet plant-based. Not all my family are with me in this though – my husband and youngest daughter in particular. So mealtimes can invariably be quite a divisive affair. Anything meat-free or a meat-alternative will usually get frowned upon and tutted at, and generally scoffed at rather than scoffed. But not this bean casserole, which has become a familiar and easy staple this autumn. Hearty, tasty, one pot cooking – it’s simple and satisfying. When HECK sent me samples of their new vegan range of sausages to try out, I reckoned they’d be the perfect accompaniment to this casserole. HECK say the recipe for their new sausages has been four years in the making and, as well as being plant-based and gluten-free, they’re all high fibre too. What I really liked about them – and possibly what my husband and daughter didn’t – is they’re not ‘fake meat’. I really don’t like those veggie sausages that pretend to be meat. That fake meat texture really doesn’t do it for me. Bleurghh! With these sausages, you really taste the veggies, pulses and spices – they’re the stars here. Bollywood: cauliflower, green lentils, pulses and seeds, spiced with chilli, ginger, cumin and turmeric. But as I say the others weren’t impressed, and wanted to know why they couldn’t have ‘real’ bangers. Ah well, you can’t please everyone all the time I guess. Heat the oil in a large heavy pan over a medium heat. Add the celery and carrots and cook for five minutes or so, stirring often. Then add the leeks and cook for another couple of minutes or so before stirring in the caraway seeds, courgette, oregano and garlic. Give it another five minutes, before adding the tomatoes and stock. Stir in the kale, then bring to the boil and then simmer without a lid for around half an hour. Stir every now and then. Cook until the vegetables are just tender. Tip in the beans and warm through for a few minutes. Add a good squeeze of lemon juice and season to taste. Serve with some tasty vegan sausages, a bowlful of hot, fluffy rice or a big pile of garlicky mashed potato. If you’d like to try out more vegan recipes, you’ll find some delicious ideas on the The Vegan Society’s website, along with info on their new app VeGuide app with everything you need to start your own vegan journey. Disclosure: I was supplied with complimentary samples for review purposes. As ever all views expressed are mine and only products I genuinely like make it onto my blog – and I’ll let you know if not all the family agree with me! Autumn is almost upon us. We enjoyed the warmth of the sun yesterday on our bike ride under the Suspension Bridge towards Pill, but by the time we got home there was a distinct nip in the air. The blackberries are out in full force, the leaves have started to turn and we spotted conkers and acorns on the ground. It’s a brilliant time of year. While summer is for picnics in the park and eating out, autumn marks the return of proper home cooking – making the most of the glut of glorious autumn vegetables; cooking up slow, hearty, satisfying dishes to warm the cockles. Shakshuka is one of our favourite weekend brunch dishes. 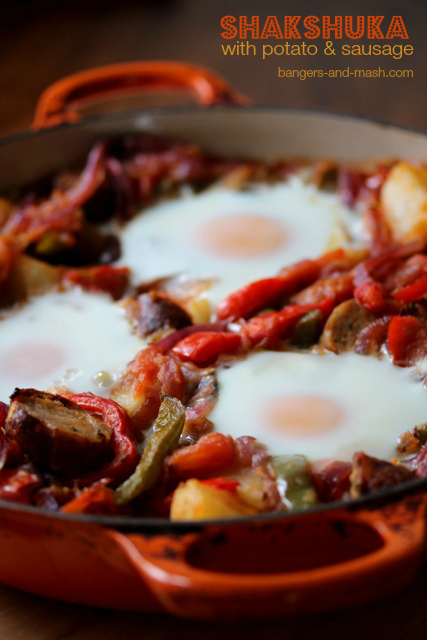 It’s essentially a spiced tomato and pepper stew with eggs poached on top and hails originally from North Africa. As you may have noticed, I’m a sucker for any dish that comes with an egg on top. We play around with the ingredients of our shakshuka quite a bit – it’s one of those versatile dishes that lends itself to experimentation. 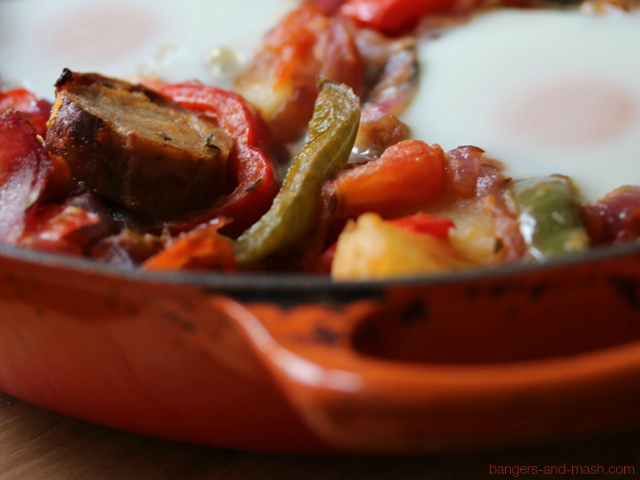 This particular variation is very good and very satisfying, bringing together flavours of North Africa with elements of a Full English, namely sausage and potato. If you happen to have either or both of these leftover in your fridge, it’s the perfect way to put them to good use. The addition of sausage is rather fitting as this week is British Sausage Week, an annual celebration of the traditional Great British Banger. We adore sausages here at Chez Bangers, as you might have guessed, but we are very fussy about the sausages we buy. Only proper bangers with a high meat content from happy pigs make it onto our table. 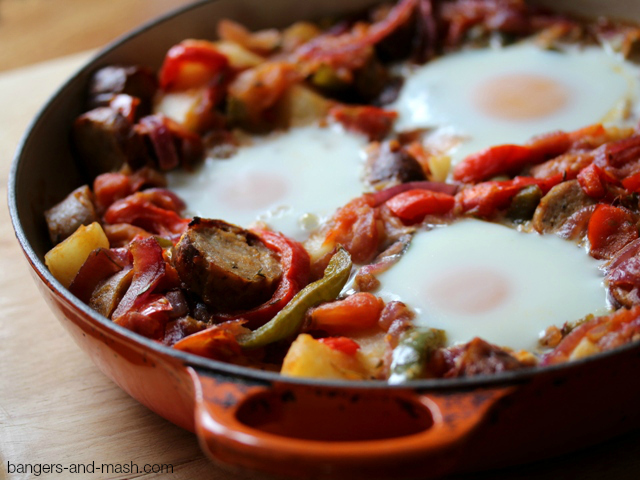 For this shakshuka, I used delicious Cumberland pork and honey sausages from Donald Russell, an award-winning online butcher. They are beautifully flavoured with herbs and spices and there’s a subtle sweetness from the honey, which works so well with the spicy vegetable stew. All Donald Russell sausages are made with Freedom Food pork shoulder meat as standard. Make sure you serve this up with lots of crusty white bread for mopping up all those gorgeous spicy juices and runny egg yolk. Dry roast the cumin seeds in a large frying pan for a couple of minutes, before adding the oil and onions. Gently cook the onions for 5 minutes, then add the peppers, bay leaves and thyme. Continue to cook gently for 10 to 15 minutes. Next add the chopped tomatoes, cayenne and season to taste. Turn the heat down low and cook for another 15 minutes. Then stir in the cooked sausages and potatoes. Preheat oven to 180°C / gas mark 4. 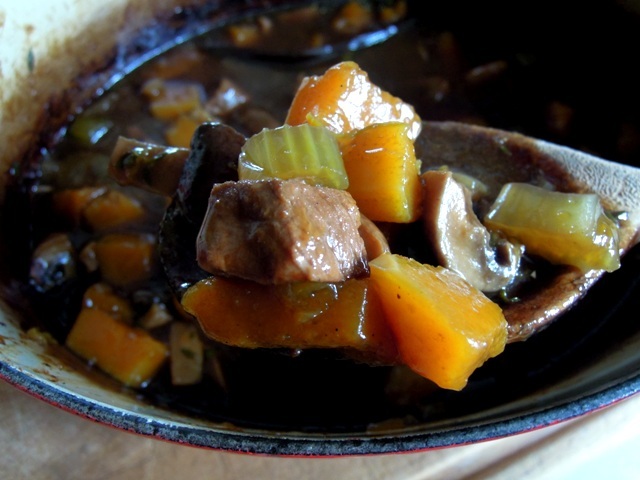 Pour the stew into a large, flat, ovenproof dish. Using the back of a ladle or large spoon, make ‘dents’ in the stew into which you then break your eggs. Place the dish carefully in the oven and cook for 10 to 15 minutes until the eggs are just cooked – the whites should be set but the yolk still runny. Serve immediately with lots of fresh, white bread. Disclosure: I received a selection of complimentary sausages and sausage products from Donald Russell for review and recipe development. No money exchanged hands and all opinions expressed are my own. For details of the full range visit www.donaldrussell.com. When Solange at Pebble Soup suggested vanilla as the theme for this month’s Spice Trail, which she is very kindly guest hosting for me, my mind went into overdrive. I simply had to come up with a way to use this gorgeous spice in a savoury dish. 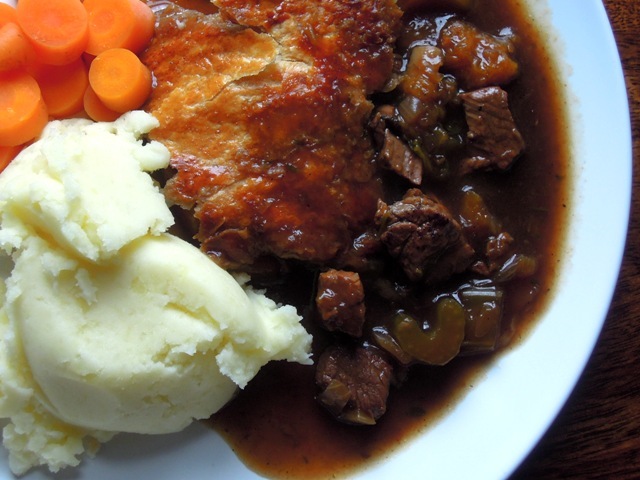 And this deeply dark and delicious beef and Guinness pie is what I came up with. My husband was the inspiration. He thought vanilla might work well in our favourite braised pig cheek recipe. I’m sure that would be heavenly but, as I’ve only recently featured the dish here on the blog, I couldn’t really go with that again. So the idea of pairing vanilla with slow cooked with meat in a rich, warming sauce evolved instead into this sumptuous beef pie. Vanilla and Guinness are a genius combination. Soft and rich and ever so slightly sweet, but without being cloying. The vanilla flavour is subtle; just enough sweetness to be warm and comforting. Teamed with tender beef and vegetables – I opted for butternut squash and celery to continue the sweet them and some chestnut mushrooms for texture and a touch of earthiness – and topped with buttery puff pastry, this dish is definitely my idea of foodie bliss. Preheat the oven to 180°C / gas mark 4. Heat the oil in a large casserole and fry the beef until browned on all sides. Stir in the corn flour to coat the meat. Add the onion, mushrooms, celery, butternut squash, Guinness, beef stock and thyme. Split the vanilla pod lengthways and scoop out the seeds with a spoon. Add the seeds to the pan, along with the pod. Season to taste and give it all a good stir. Bring it to a gentle simmer. Pop the lid on and place in the oven for at least three hours until the meat is beautifully tender. Remove the stew from the oven and leave to cool. Turn up the oven to 200°C / gas mark 6. 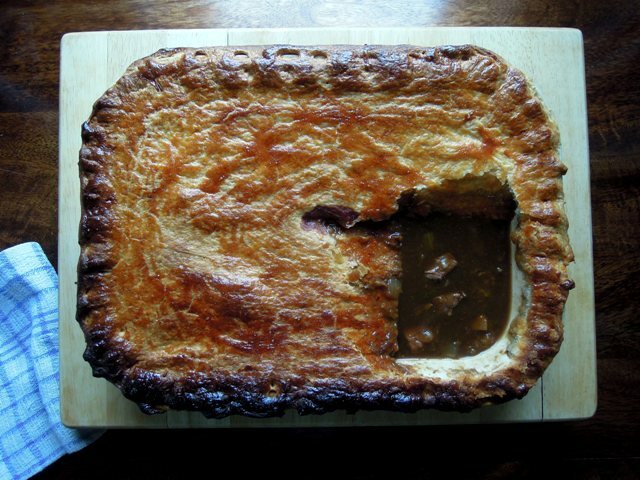 Transfer the stew to a ovenproof pie dish (around 2 litre). Brush the edges of the pie dish with a little beaten egg and carefully lay the ready rolled puff pastry over the top of the stew. Knock the edges with the back of a knife so they stick to the dish and trim off the excess pastry. With a sharp knife, cut a little hole in the middle of the pastry to allow the steam to escape and brush the top with beaten egg. Bake in the oven for 30-40 minutes, until the top is golden brown. Serve with vegetables and creamy mashed potato to soak up all that meaty vanilla-flavoured gravy. I am entering this pie into The Spice Trail, which is of course being hosted this month by Solange over at Pebble Soup, and where the spice theme this month is vanilla. And as this pie also contains lots of lovely fresh thyme, I shall also enter it into Cooking with Herbs, hosted by the brilliant Karen at Lavender & Lovage. Other than tinned oxtail soup as a child (which I don’t think really counts), I hadn’t eaten oxtail until just the other week when I got hold of some at my local butcher and decided it was time to try it out on my family. I’ve been meaning to cooking with it for quite some time but for one reason and another hadn’t got round to it. It’s a wonderfully cheap cut and I’d heard how full flavour and “unctuous” it can be when cooked long and slow – perfect for us as we cook in an Aga. And I certainly wasn’t disappointed. I turned to that classic Italian cookbook, The Silver Spoon, which I always tend to consult when faced with a new cut of meat, and found a recipe for a slow-cooked oxtail, cooked very simply with soffritto (onion, carrot, celery and garlic), white wine and pancetta, or in my case beef stock and smoked bacon. The result was truly unctuous. So it might not be the prettiest of plates but it tastes divine. 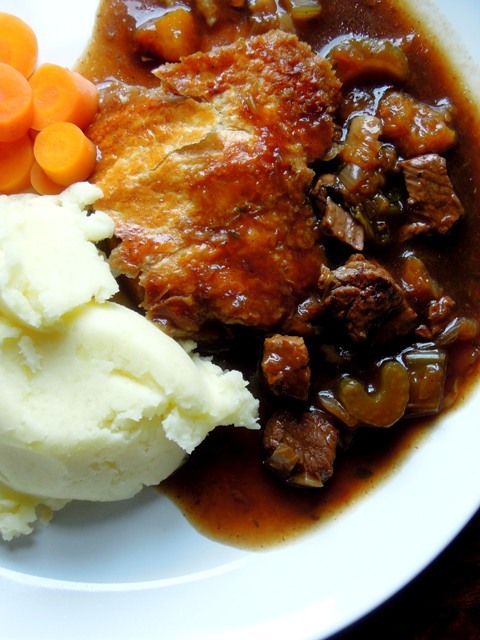 A properly rustic kind of dish which demands eating with fingers to make the most of all that gorgeously sweet meat clinging to the bones, with plenty of cartilage to be gnawed and marrow to be sucked. The vegetables seem to soak up the gooey, marrow-rich sauce making them beautifully soft, and a large helping of creamy mashed potato is just wonderful served on the side. What did disappoint was how squeamish the children were about getting stuck in. This isn’t normally a problem in our house, where we’re used to sticky fingers and dribbly chins. Perhaps I left a little too much fat on the oxtail or maybe it was simply the idea of eating a beast’s rear appendage, but I was surprised at how much encouragement my kids needed to finish their plates. Don’t worry, I never give up on the first attempt. This is definitely a dish I’ll be trying on the clan again soon. I loved it so much, it’s now my mission to make my family love it too. 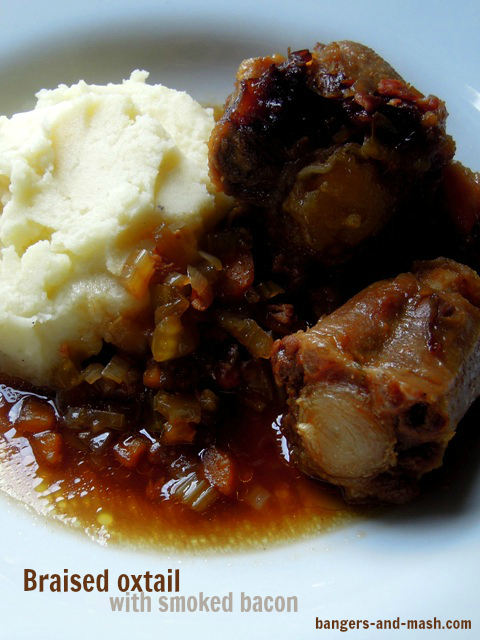 Remove any excess fat from the oxtail and then soak in cold water for three hours, changing the water a couple of times. Drain and pat dry with kitchen towel. Preheat the oven to 140°C/gas 1. Heat the butter and oil in a large ovenproof dish, add the bacon and fry for 5 minutes until coloured. Add the oxtail pieces and brown all over. Stir in the onion, carrot, celery and garlic and fry together for a few minutes before pouring in the hot beef stock. Add enough hot water to just cover the ingredients and season to taste. Bring to a gentle simmer, then cover with a lid and transfer to the oven to cook for three to four hours, until the meat comes easily away from the bone and the juices have thickened. Serve with plenty of creamy mashed potato to soak up all that delicious sauce. And make sure you have napkins to hand. 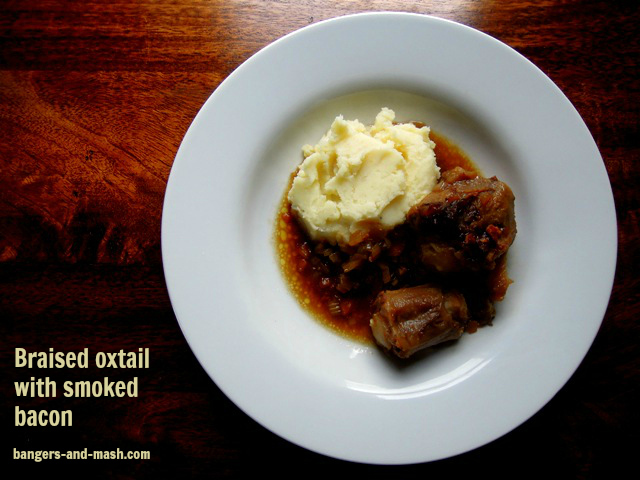 Oxtail is a very inexpensive cut of beef and so I am entering this dish into May’s Family Foodies challenge (hosted by myself and Eat Your Veg), where the theme is ‘Cheap and Cheerful’. I’m also entering into Credit Crunch Munch, co-hosted by Camilla at Fab Food 4 All and Helen at Fuss Free Flavours, and this month guest hosted by Gingey Bites. 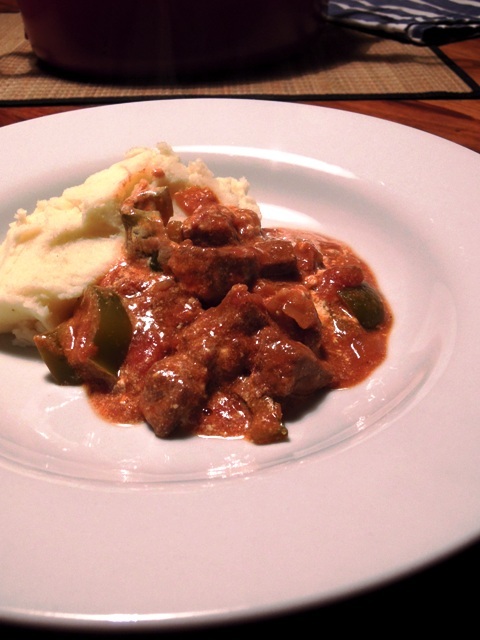 We ate this goulash for Sunday lunch the other weekend. It was absolutely delicious but sadly I can’t take credit for the recipe. It was sent to me by my Twitter pal Jacki Harrison-Stanley for entry into The Spice Trail challenge, which this month is celebrating paprika. As Jacki isn’t a blogger, I happily volunteered to post the recipe for her and just had to try out the recipe on my family. They loved it. And it was very simple to make, which is always a big bonus. Jacki recommends serving her goulash with rice or a baked potato. We happened to have a whole load of spuds that needed using up, so I opted for mashed potato instead, made with plenty of butter and some of the leftover soured cream. Heat the oil in an ovenproof casserole dish and brown the steak on a high heat. Remove the meat. Reduce the heat and cook the onions for 5 minutes. Add the garlic and return the meat to the casserole dish. Sprinkle in the flour and paprika, and give it a good stir to soak up the juices. Add the tomatoes and season to taste. Bring slowly up to simmering point and then cover with a tight-fitting lid. Place the casserole dish in the Aga simmering oven for 2 hours or in a conventional oven at 140°C / gas mark 1. After 2 hours, add the chopped pepper and then cook for a further 30 minutes. Just before serving, stir in the soured cream to give your goulash a beautiful marbled, creamy look. Sprinkle with a little paprika, and serve with rice or a baked potato. My thanks again to Jacki for another brilliant recipe. 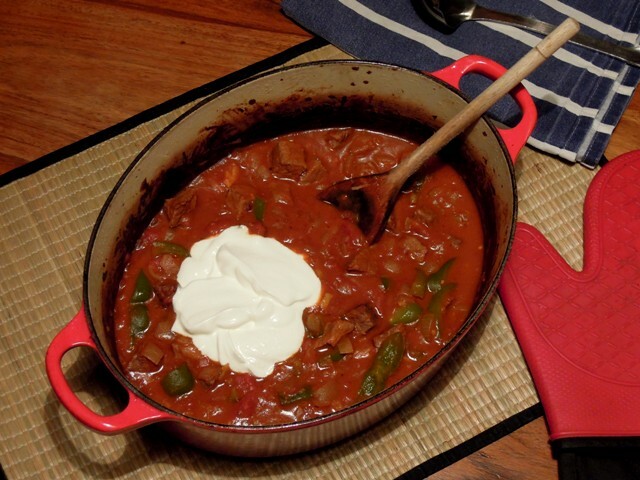 As Jacki’s goulash is flavoured with paprika, it is being entered into this month’s Spice Trail challenge, a monthly event hosted by me! This recipe comes from Jacki, one of my foodie friends on Twitter. Jacki is a fellow Aga owner and BBC 6 Music listener, and we share a passion for hearty, slow cooking. 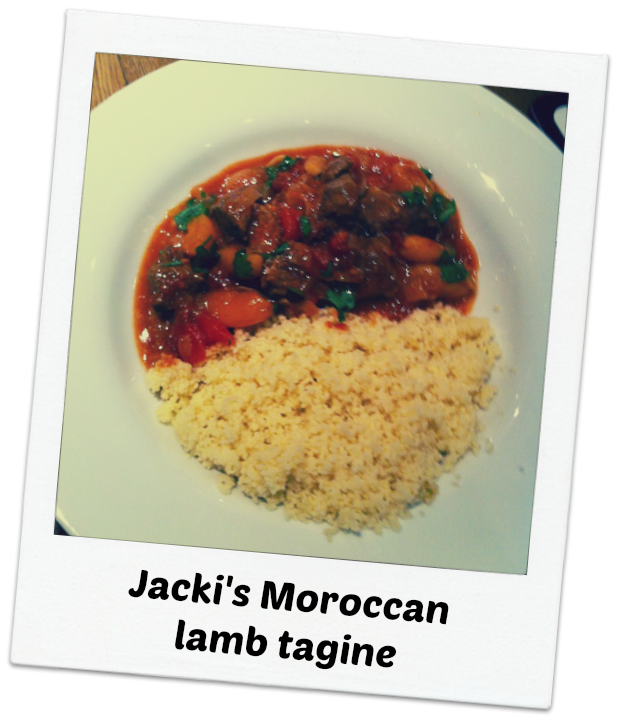 She was keen to enter her lamb tagine into the Spice Trail challenge, as it features this month’s spice, cinnamon, but as she isn’t a blogger herself I offered to share her recipe here. In Jacki’s words, it’s “very simple but lush”. 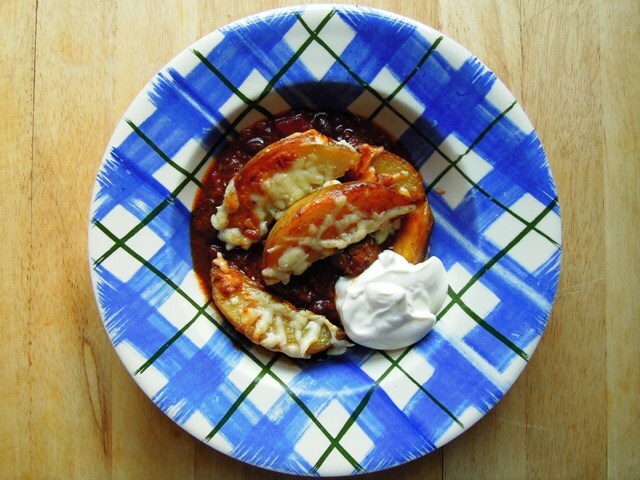 I can’t wait to try it out on my family – it looks like a delicious winter warmer. Combine the lamb with the oil and spices and marinade overnight, although shorter is OK.
Fry the meat to seal and colour, and place in your tagine. Fry the onions and garlic until soft, then add all remaining ingredients to the pan. Bring to a simmer and pour over the meat in the tagine. Cook in the Aga simmering oven for 2 hours or so – or in a conventional oven at 180°C for 1½ hours. Remove the lid for the last 10-15 minutes. Inspired by a ‘Select Lincolnshire’ recipe in The Good Taste magazine Lincolnshire. 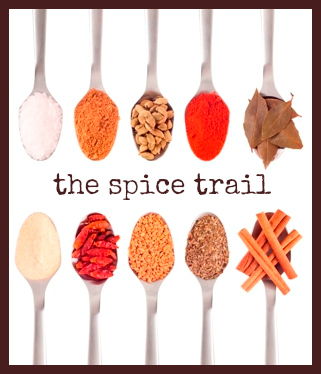 If you have a favourite cinnamon recipe you’d like to share in December’s Spice Trail challenge, you’ll find more information here. And you might just win yourself a Tasting Experience for two courtesy of the good people at Buyagift. 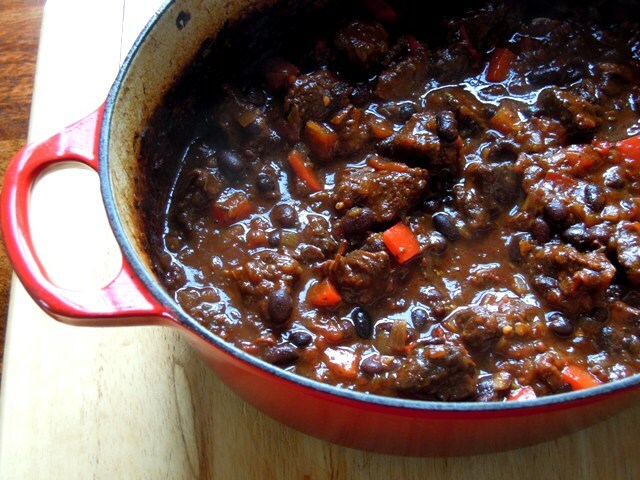 This chilli beef ticks all the right boxes for me. It’s a proper winter warmer, pretty much all cooked in one pot. The beef is slow cooked so it practically falls apart in your mouth and is flavoured with delicious cumin, chilli, cinnamon and oregano. It’s topped off with crispy, spicy potato wedges. Oh and it’s got melted cheese on top too. Really, what’s not to like? It’s the first dish I’ve tried from the Higgidy Cookbook and I’m now looking forward to working my way through the rest of the book. The lamb shank pie is another I’ve got my eye on. Crush the cumin seeds and chilli flakes in a pestle and mortar and then pour into a large bowl. Stir in the cinnamon, oregano and 1 teaspoonful of salt. Add the chunks of beef and toss well to completely coat the meat. Place your casserole dish over a medium heat and add a tablespoonful of the oil. Brown the beef all over in batches. Don’t let the spices burn or they will turn bitter. Put the browned meat in a bowl. Pour a little water into the pan, scrape the bottom with a wooden spoon to loosen all those lovely tasty bits, and then pour this over the beef. In the same pan, heat the rest of the oil and then gently fry the onion, garlic, coriander stalks (reserve the leaves) and chillies until soft. Add the puree, stock, tomatoes and hot stock, and give it all a good stir. Cook for a minute or two. Add the beef and bring to the boil. When the stew comes to the boil, remove from the heat and cover tightly with the lid. Cook in the oven for two hours. Add the pepper and black beans, stir well, season with salt and pepper to taste, and then return to the oven with the lid back on for another 20 minutes. Remove from the oven and stir in the coriander leaves. Keep to one side with the lid on to keep warm. Increase the oven to 200°C / gas mark 6. Cut the potatoes into chunky wedges and boil in salted water for around 8 minutes until just tender. Drain well and put into a roasting tin. Drizzle with the oil and sprinkle with paprika and salt and bake for half an hour until crisp and golden. Preheat the grill to medium-high. 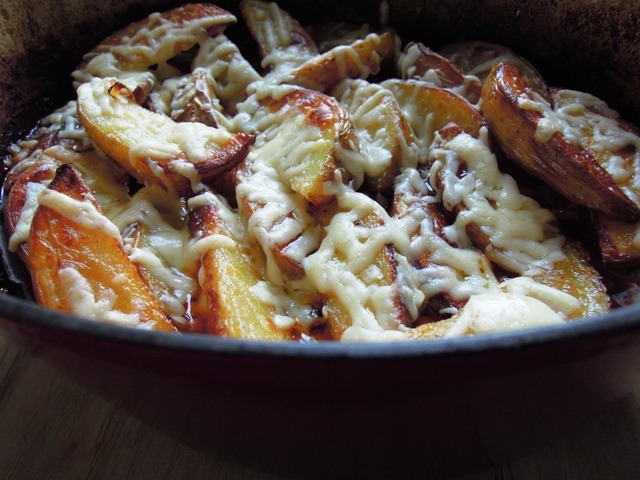 Scatter the wedges over the top of the stew, top with grated cheese and pop it under the grill until the cheese has melted. Serve with soured cream. Enjoy! As this stew-slash-pie features my favourite chilli, I’m entering it into The Spice Trail challenge, which has chilli as this month’s theme. And as this pie-slash-stew is cooked almost entirely in one pot, I’m entering it into the Four Season’s Food challenge, hosted by Eat Your Veg and Delicieux, where the theme this month is Soups, Stews & One Pot Wonders. If you’re looking for more winter-warmers, head over there for some great inspiration. Somehow I completely failed to spot that this week is National Sausage Week here in the UK. Now if anyone should be celebrating the humble sausage, it clearly should be Bangers & Mash. The amount we consume in our house contributes significantly to supporting the British sausage industry, I’m sure. Thankfully, I had this very tasty sausage dish waiting in the wings to appear on the blog – a perfect winter warmer for all the family on these darker, colder days. So bumped up the running order a little, I bring you the ‘Star Wars’ sausage stew, a recipe my children (and us grown ups too) adore, which I discovered in my old Blue Peter Book of Gorgeous Grub, circa 1980. The topping of crushed up plain crisps and grated cheese takes me back to my childhood when crisps seemed to appear in hot dishes all the time. As a child I was a committed fan of the BBC children’s programme Blue Peter, winning a total of four badges over the years in various competitions. I was forever pestering my mum for old boxes, loo roll holders and sticky backed plastic so that I could make the latest Blue Peter creation. But for some reason I never tried to recreate any of their recipes. It was my dad who recently dug out this cookbook, which, to be totally honest, I can’t remember having as a child as I wasn’t really all that interested in food back then. Oh how things change! So I’m rather enjoying working my way through all the recipes that were submitted by Blue Peter viewers, answering the call from presenters Simon Groom, Chris Wenner and Tina Heath. We called it this because it was invented when we wanted a hot meal waiting for us when we came home from seeing the film ‘Star Wars’. I wonder where Elspeth is now and whether she still makes her Star Wars sausage stew? Preheat the oven to 150ºC / gas mark 2. Heat the oil in a large casserole and brown the sausages, then remove to one side. Add the onion and bacon to the casserole and gently brown. Throw the sausages back in, as well as the beans, sweetcorn and tomatoes. Add the bay leaf, season well with salt and pepper and give it all a good mix. Top with the sliced potatoes and season again. Cover with a lid or foil and cook in the oven for around two and a half hours. Remove the lid or foil and turn up the heat to 190ºC / gas mark 5 and cook for another half an hour to brown the potatoes. Finally top with the crushed crisps and cheese and return to the oven until the cheese has melted. Serve immediately.